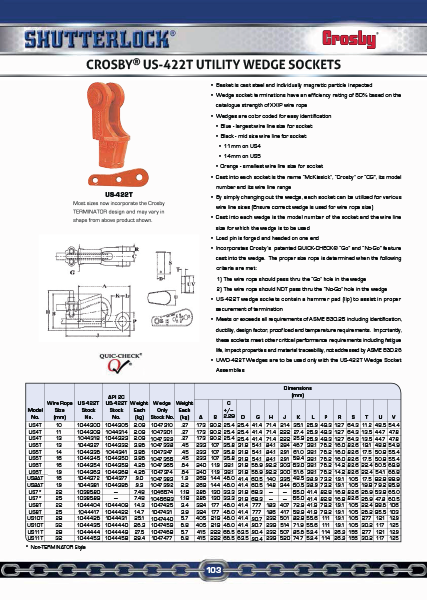 Wedge socket terminations have an efficiency rating of 80% based on the catalogue strength of XXIP wire rope. Blue – largest wire line size for socket. Black – mid size wire line for socket. Orange – smallest wire line size for socket. 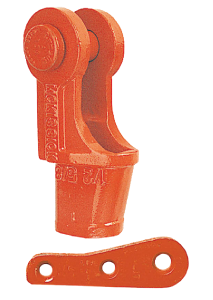 US-422T wedge sockets contain a hammer pad (lip) to assist in proper securement of termination. Crosby products meet or exceed all requirements of ASME B30.26 including identification, ductility, design factor, proof load and temperature requirements. Importantly, these sockets meet other critical performance requirements including fatigue life, impact properties and material traceability, not addressed by ASME B30.26. UWO-422T Wedges are to be used only with the US-422 Wedge Socket Assemblies. Crosby products meet or exceed all requirements of ASME B30.26 including identification, ductility, design factor, proof load and temperature requirements. Importantly, these products meet other critical performance requirements including fatigue life, impact properties and material traceability, not addressed by ASME B30.26. 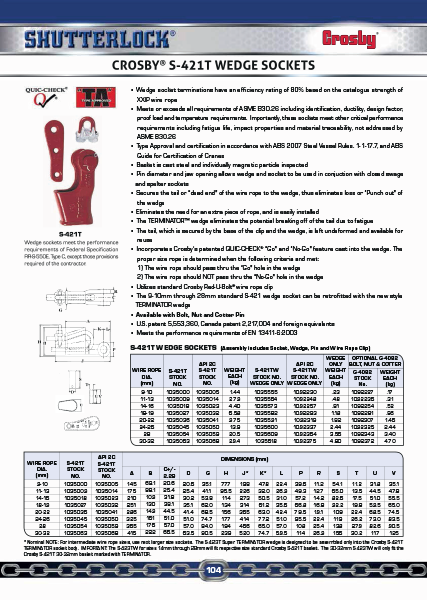 Pin diameter and jaw opening allows wedge and socket to be used in conjunction with open swage and spelter sockets. The tail, which is secured by the base of the clip and wedge, is left undeformed and available for reuse. 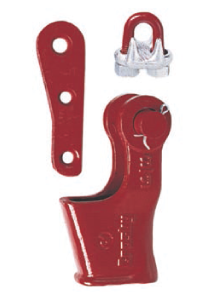 Utilizes standard Crosby Red-U-Bolt® wire rope clip.Standard S-421 wedge socket can be retrofitted with the new style TERMINATOR™ wedge.